Political Arithmetik: Bush approval passes 40%, and rising. The Gallup/USAToday poll taken 7/6-9/06 finds approval at 40%, with disapproval at 55%. This is the first time approval has been as high as 40% in the Gallup poll since Feb 9, 2006. My estimated approval trend (the blue line) also stands at over 40%: 40.009% to be specific. The last time the trend was that high was Feb 16. The current rally in approval of President Bush has now gained 9 percentage points from the Gallup low of 31% on May 7. My trend estimate has seen a gain of just over 6 points from it's low of 33.98% on May 12. 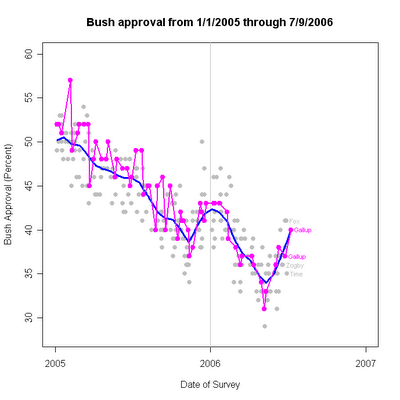 For comparison, the President lost 8.37 percentage points between January 5, 2006 and May 12. The current movement has erased about three quarters of that loss. The current rally is also impressive for outpacing the November 11-January 5 increase which amounted to only a 3.7 percent increase over a similar length of time, based on my trend estimate. The White House announced this week that the President will be traveling the country for much of the summer, spending relatively little time in Crawford. It will be very interesting to see if those efforts support and sustain the current upturn in approval. If so, the fall elections look rather different than they will if approval stabilizes or starts down again.